First of all, I want to tell you, that I replaced http://ninasstyleblog.blogspot.com with my own domain address: www.ninasstyleblog.com , And changed my blog design. I hope, you like this new look. OK, so now, let me tell you little bit about this moisturizer. "A high potency nighttime moisturizer to help skin optimize its moisture balance. Boosts your skin's defenses: the combination of Omega 3 and 6 with Vitamins E and C helps strengthen skin's ability to defend itself against external aggressors. Results: wake up to soft, smooth skin, recharged, radiantly luminous. 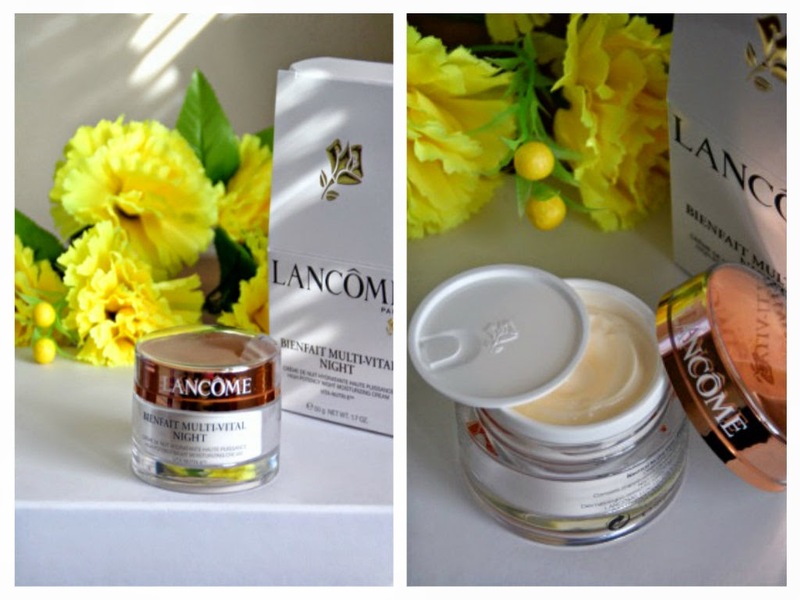 Since I have used Lancome Bienfait day moisturizer and was quite happy about the results, I decided to give this Bienfait Multi-Vital night moisturizer a try, as well. It's a very light, non-greasy moisturizing cream that is little different from any other moisturizers I have used. This one is extremely moisturizing cream. After applying it, your skin can feel right away that something magical happened to it (I'm not kidding). This Lancome night moisturizer gives my dry, sensitive skin some amazing feeling. The difference, I was talking about, is that every time I apply this moisturizer, my skin instantly becomes hydrated, nicely moisturized, at the same time, I really feel that "Locks in moisture" feature, that the label of this cream was announcing. Don't think it's a greasy cream sitting on the skin , I would say, this cream feels like moisturizing the skin inside and outside, at the same time. This Lancome Bienfait Multi-Vital Night Moisturizing cream has very light, pleasant smell and even though it's quite expensive, it's worth it, because little goes a long way. I am really glad I purchased this moisturizer because it really makes my dry, sensitive skin__ soft, and glowing by morning. Have you tried this Lancome night moisturizer? Let me know in the comments below. Love the new look of your blog! Very elegant and refined. :) Thanks for sharing this review. Lancome always has great products. I love Lancome products, great brand!!!! I usually have great success with Lancome products! Great review! Would love to try this one out, having been looking for a new night cream for my skin! Thanks so much for this review! I love Lancôme products! I definitely need to try this! Cool blog great review very well presented. Amazing review, I'd love to try this! I adore Lancome makeup, but never tried their skincare. Think I may have to start! I love Lancome products, but I'm a little bit tentative to try their creams because I often find them to be too scented for my liking. They have some other great products though! Hi doll, kisses from Italy! Such a lovely blog design you have here and this sounds like an amazing cream! I must try it sometime!